How fabulous for them to give you 25 blocks! Wow! it is beautiful. Well done! They look wonderful. I've been working on one very slowly for a few years now and I think you have more done than me at this point! Keep on your roll - I'm getting inspired to work on mine again! its a "how do you eat an elephant" quilt. 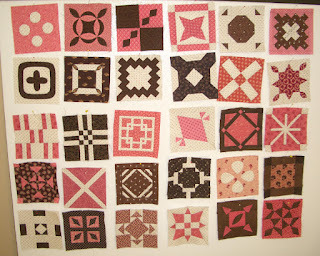 Loved the clover quilt--I will have to look in my book again. I finally decided that I didn't really like the 40 or so blocks that I had made so I gave them away. I am so glad. I want to restart and make one out of brights but Farmer's Wife jumped in line first. Beautiful!! I have 10 or so done, I can't imagine having almost half of it done. Love your colors. That is a whole lot of blocks. I know it will be a treasure when it is completed.